Today a user of my app Week View 8 sent me an email that there is another app with the same name in the windows phone store. 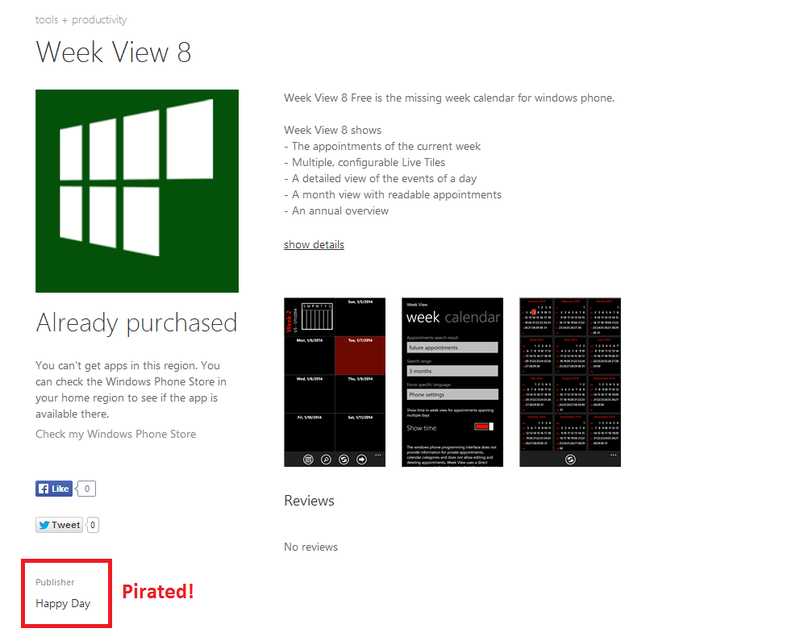 I checked this and it’s true – there is a pirated version of Week View 8 in the windows phone store. I installed it on my phone to ‚test‘ it – it is a rather old version (2.5.1) for windows phone 7.x. The current version of Week View 8 ist 8.7.1. The app tries to show adds. In the about page of the app still my (!) support email adress shows up and meanwhile I am getting error reports from users that are using this illegal version, most likely because they do not even know, that it is a pirated copy of my app. Please do not use this illegal version – it is rather old, has bugs and does not support WP8 features like the real Week View 8 app does. Of course it does not get updates and support too. I already sent a support ticket to microsoft to report the copyright validation. 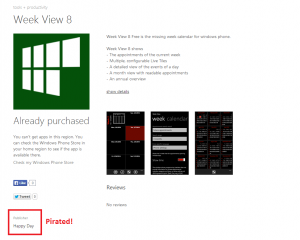 I hope the pirated version will be removed from windows phone store soon. Diese Version ist jetzt auch schon bei „Neu und Angesagt“ zu finden! Seltsam, dass Microsoft so was zulässt. Dies ist kein gutes Signal an App-Entwickler! Ich hoffe selbst, dass seitens MS hier bald etwas passiert d.h. die illegale App Version aus dem Store entfernt wird – gemeldet habe ich den Vorfall vor nun 5 Tagen. anzeige? ist schon eine äußerst dreiste tour! Im Moment warte ich noch auf eine Aktion bzw. die Entfernung der illegalen App aus dem Store seitens MS. So eine Dreistheit… bin mal gespannt was MS da tun wird. Beweisen das es dein Code ist kannst du ja. Es gibt seitens MS sogar ein eigenes Formular für solche Fälle – diese habe ich natürlich schon ausgefüllt und übermittelt. Die Beweisführung ist recht einfach, nachdem in der About-Seite der illegalen App sogar meine EMail Adresse steht.